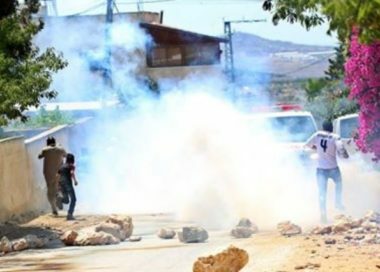 Medical sources have reported that several Palestinians suffered, on Saturday at dawn, the severe effects of teargas inhalation, in Jaba’ town, south of the northern West Bank city of Jenin. Eyewitness said the soldiers installed a military roadblock at the main entrance of the town, before stopping and searching dozens of cars, and interrogated many Palestinians while inspecting their ID cards. They added that many youngsters from the town protested the invasion, and hurled stones at the soldiers, while the army fired many gas bombs and rubber-coated steel bullets, causing several Palestinians to suffer the effects of teargas inhalation. The soldiers were also extensively deployed at the eastern and western area of the town.